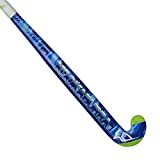 Like the new leaves of spring which bud just as the hockey season draws to an end, the Malik FRESH hockey stick is crisp and full of energy to help out the player holding it. This review is for the Malik FRESH 2015 outdoor edition. Providing a review of any hockey stick from Malik with the dribble curve shaft is always great. On a stick that is so fairly priced for the quality of it is particularly new and exciting! There is no doubt Malik produce quality hockey sticks and the Fresh for me is in there with the best. We have been blessed with a previous version of the Malik FRESH a few years back and now it’s back better then ever. By far the best thing to review about the Malik FRESH is the addition of Malik’s new carbon wrap. Sounds like it has a piece of cling film around it, actually it is applied during the manufacturing of the hockey stick. If you have ever heard the term “layup” discussed as part of hockey stick manufacturing, then this is what it is all about. The layup of the Malik FRESH is such that layers of materials are applied in to the mould of the hockey stick, with carbon fibre the predominant material on the outer layer of the shaft. This means that carbon fibre makes first contact with the ball, giving that crisp, solid hit that you would get from a full carbon stick even though the Malik Fresh is just 75% carbon (50% in Europe & the US). Additional power and accuracy is noticeable with this feature of the Malik FRESH and something I really enjoyed about the stick while preparing this review. Many times over we have written reviews of how great the Malik Dribble Curve is. This well balanced shaft 24mm deep and 270mm up from the heel is included on the Malik Fresh review. Only available in Light and Extra light the Malik Fresh is made for hockey players who like responsiveness and control from their stick. It is one of the most manoverable sticks on the market in my opinion and the extra light version is barely noticeable on your arm. The great thing to review is that the extra light version of the Malik FRESH is available in 37.5” length which makes it one of the best light hockey sticks available. Its always a pleasure to review a Malik hockey stick and the FRESH is great. I think they are one of the most under-appreciated hockey stick brands and I can’t wait to get hold of another Malik hockey stick to review. In the UK you will notice this stick has a white handle. In Europe it will have a black one. No body knows why but they are exactly the same stick otherwise. If you are not aware of the complete 2015 Malik hockey stick range then jump over to our page on it to get a full overview of this years Malik hockey sticks.